Network (PNN) Classifier is used to classify the Kannada, Telugu and Devanagari numerals ... which is thinning free, independent of size, and font styles of the. R.C. "Athena". Maroussi .... the results of a punctuation mark detection algorithm. 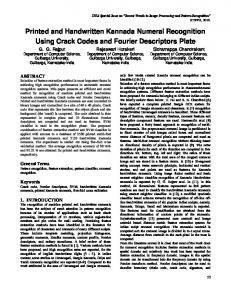 The .... document image 354.tif from ICFHR10: (a) the estimated pdf (vertical. Kannada is a language spoken in south India ... in English language , Moreover the Kannada ... compound character in Kannada language shown in. printed and hand written isolated Kannada numerals using single ... letters, etc. .... these coefficients restores s(k). That is, s(k)=. 1. 2. /. 0. ( ). K j uk K u au e Ï. Proc. of the 5th Int. Conf. on Digital Forensics, Orlando, FL,. USA, January ... 2, pp. 79â92, 2010. 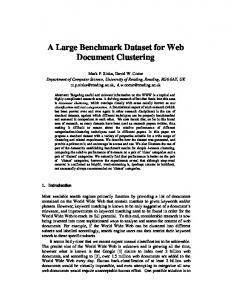 V. J. Hodge and J. Austin, âA survey of outlier detection. Figure 1. Samples of the color noise. The chromatic / achromatic split has several further ap- ... the Nyquist-Shannon sampling theorem was not respected,. verification and testing, correspondingly. A dataset of Persian texts are introduced in . It can be used for different tasks of Persian text-line segmentation, word segmentation, character segmentation/recognition etc. In Indian languages domain the situation is worse compared to the other languages in terms of availability of standard datasets although India is a multilingual, multiscript country. Recently, researchers have provided some datasets for off-line handwritten Bangla and Devanagari numerals and characters [14–16]. An on-line handwritten dataset for Tamil and Kannada words (OHR) was also provided . The database presented in  contains 22556 Devanagari numeral samples written by 1,049 persons and of 23392 handwritten Bangla numeral samples written by 1106 people. In  numeral recognition of six Indian scripts are presented and this dataset is also available. However, to the best of our knowledge no benchmark dataset is available for text-pages of Indian languages. From the literature, it can be noted that most of the current non-Indian languages databases are contained only handwritten isolated digits, characters or extracted words. Only a small number of the current available databases include sentences or text-pages. Lack of standard databases can be considered as one of the reasons of the slower development of OCRs for Indian languages [19, 20] rather than the Latin based languages. Considering these issues, we propose to develop a Kannada handwritten texts database (KHTD) containing 204 text-pages of four different categories of stories and general news, sentences of sports news, movie and medical news written by 51 Kannada native speakers. Two types of ground truths based on pixels information and content (line-wise, word-wise and characterwise) information are generated in the proposed database. The organization of rest of the paper is as follows: In Section II we briefly illustrate characteristics of Kannada scripts and Section III describes the proposed KHTD dataset. Ground truth extraction and some preprocessing are described in Section IV. In Section V, we demonstrate the results of two state-of-the-art text-line segmentation methodologies on the KHTD. Finally, we present conclusion in Section VI. characters. In most of the text-pages of the KHTD either an overlapping or a touching text-lines exist. The KHTD can be used for Kannada text-line segmentation, sentence recognition/ understanding, word segmentation/recognition, segmentation the words into characters, word spotting, textline extraction, and writer identification etc. Then we draw manually some separating lines to segment individual text-lines. Manually drawn separating lines are shown in Figure 2. The background pixels of the binary document image will get values of zero and the pixels belonging to each segmented text-line will get a unique value greater than 0. For example, if we have 10 text-lines in a text-page, all the pixels belonging to the foreground part of the first text-line get value of 1, all the foreground pixels belonging to the second text-line get value of 2 and so on. Final GT information of the text-page shown in Figure 1 is given in Figure 3. As a result, we create a set of GT files and the number of GT files is equal to the number of text-pages presented in the proposed database. The GT files have the same name as the original files had and only an additional file extension of “.DAT” is added to the original filename. For example for the text image of “kannada_1_001.TIF” the GT filename will be “kannada_1_001.TIF.DAT”. Figure 1. A scanned gray level image of handwritten Kannada text is shown here as sample. IV. GROUND TRUTH For automatic evaluation of results of any segmentation/recognition system, the ground truth (GT) information plays a significant role. However, it is an errorprone and time-consuming task. There are two types of GT information in the literature [5, 12]. In the first type, the GT is computed by labeling pixels of a text-page with respect to their belongingness in the background or foreground (textlines or words). This GT is useful for text-line and word segmentations. The second type of the GT is generated by creating a text-file using Unicode for every character present in each text-page image with respect to its content. This GT is useful to evaluate the recognition results. To compute the first type of GT for a text-page, first we manually removed the noise from each text-page (binary document image). based ground truth file “kannada_1_001.TXT” is obtained. The content of ground truth information of the handwritten document of Figure 1 is shown in Figure 4. As a result, two GT files (one for pixel-wise and the other one for contentbased text) for each document image are generated in the proposed database that can be used by different evaluation strategies. are connected to obtain segmented text-lines . In the PPSL technique  like the technique, proposed in , document is vertically crumbled into few stripes. In order to get Potential Piece-wise Separation Line (PPSL) between two consecutive text-lines, the white/black spaces in each stripe are analyzed. Next, such PPSLs are concatenated or extended in both the left and right directions to construct the complete segmentation lines based on distance analysis of each PPSL with left and right neighboring PPSLs. The same evaluation technique and parameters used in [5, 22] were considered for our experimentation. A table called as MatchScore is created and its values are calculated based on the intersection of the black pixel sets of the result and the ground truth. Detection (Dec.) rate and recognition (Rec.) accuracy are calculated as follows. algorithm. More details about the evaluation technique can be found in [5, 22] From the experimentation, 94.55% and 96.12% were obtained for detection rate and recognition accuracy, respectively from the technique proposed in . Overall, 95.32% of text-lines in the KHTD were accurately segmented using the technique presented in . While testing the PPSL technique  on the KHDT, the results of 95.73% for detection rate, 94.25% for recognition accuracy and overall accuracy of 94.98% were obtained. The text-line segmentation results obtained from experimentations on KHTD using the techniques presented in  and  are briefly tabulated in Table III. C.Y. 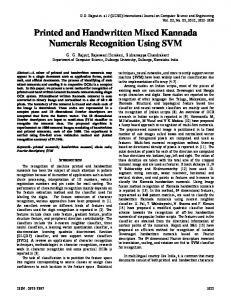 Suen, C. Nadal, R. Legault, T. Mai, L. Lam, “Computer recognition of unconstrained handwritten numerals,” Proc. of the IEEE, 80(7), 1992, pp. 1162–1180. J. Hull, “A database for handwritten text recognition research,” IEEE Trans. on PAMI, 16(5), 1994, pp. 550–554. B. Gatos, N. Stamatopoulos, G. Louloudis, “ICDAR 2009 Handwriting Segmentation Contest,” Proc. of 10th ICDAR, 2009, pp. 1393–1397. U. Marti, H. Bunke. “A full English sentence database for off-line handwriting recognition”, Proc. of the 5th ICDAR, 1999, pp. 705–708. T. M. Rath, R. Manmatha, "Word Spotting for Historical Documents," International Journal on Document Analysis and Recognition (IJDAR), 2005, pp. 139 – 152. D. Kim, Y. Hwang, S. Park, E. Kim, S. Paek, S. Bang, “Handwritten Korean character image database PE92,” Proc. of 2th ICDAR, 1993, pp. 470–473. [T.-H. Su, T.-W. Zhang, D.J. Guan, “Corpus-based HIT-MW database for offline recognition of general-purpose Chinese handwritten text,” IJDAR, 10(1), 2007, pp. 27–38. Y. Al-Ohali, M. Cheriet, C.Y. Suen, “Databases for recognition of handwritten Arabic cheques”, Pattern Recognition, 36(1), 2003, pp. 111–121. M. Pechwitz, S.S. Maddouri, V. Maergner, N. Ellouze, H. Amiri “IFN/ENIT - database of handwritten Arabic words”, The 7th Colloque International Francophone surl'Ecrit et le Document, 2002, pp.129–136  F. Solimanpour, J. Sadri, Suen, Y. Ching, “Standard Databases for Recognition of Handwritten Digits, Numerical Strings, Legal Amounts, Letters and Dates in Farsi Language,” Proc. of 10th IWFHR, 2006, pp. 3–7. M. Ziaratban, K. Faez, F. Bagheri, “FHT: An Unconstraint Farsi Handwritten Text Database,” Proc. of 10th ICDAR, 2009, pp. 281– 285. U. Bhattacharya, B.B. 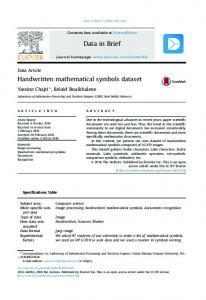 Chaudhuri, “Handwritten Numeral Databases of Indian Scripts and Multistage Recognition of Mixed Numerals”, IEEE Trans. on PAMI, 31(3), 2009, pp. 444–457. U. Pal, T. Wakabayashi, N. Sharma, F. Kimura, "Handwritten Numeral Recognition of Six Popular Indian Scripts", Proc. of 9th ICDAR, 2007, pp. 749–753. U. Pal, N. Sharma, T. Wakabayashi, F. Kimura, "Off-Line Handwritten Character Recognition of Devnagari Script", Proc. of 9th ICDAR, 2007, pp. 496–500. B. Nethravathi, C. P. Archana, K. Shashikiran, A. G. Ramakrishnan, V. Vijay Kumar, “Creation of a Huge Annotated Database for Tamil and Kannada OHR”, Proc. of 12th ICFHR, 2010, pp. 415–420. R. Bertolami, H. Bunke, “Hidden Markov model based ensemble methods for offline handwritten text line recognition”, Pattern Recognition, 41(11), 2008, pp. 3452–3460. B. B. Chaudhuri, U. Pal. A complete printed Bangla OCR system. Pattern Recognition, 31(5), 1998, pp. 531–549. U. Pal and B. 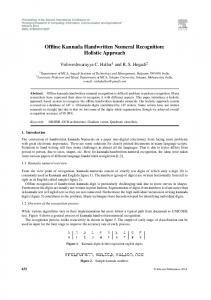 B. Chaudhuri, "Indian Script Character Recognition: A Survey", Pattern Recognition, Vol. 37, 2004, pp. 1887–1899. N. Otsu, A threshold selection method from gray-level histograms, IEEE Transactions on System, Man. and Cybernetics 9(1), 1979, pp.62–69. A. Alaei, U. Pal, P. Nagabhushan, “A new scheme for unconstrained handwritten text-line segmentation”, Pattern Recognition, 44 (4), 2011, pp. 917–928. VI. CONCLUSION A database of handwritten text-pages of Kannada is introduced. It contains 204 handwritten text-pages of Kannada. The KHTD has also two different ground truths based on pixels and text-content information. This characteristic of the KHTD provides two different evaluation strategies for the researchers to evaluate the performances of their algorithms. This database can be used in many areas of document image processing such as sentence recognition/understanding, text-line segmentation, word segmentation/ recognition, segmentation of the words into characters, word spotting, writer identification, discrimination between handwritten and machine printed texts of Kannada etc. The KHTD is available freely to the researchers by contacting to the authors. ACKNOWLEDGMENT The authors would like to thank Mrs. Vijaya Kumari, Mrs. Noor Sara, Mrs. Archana and Mrs. F. Alaei of the Department of Studies in Computer Science, University of Mysore, Mysore, India who has helped us for collecting the documents and preparing the ground truths. The authors would also like to thank all writers who contributed for this dataset. REFERENCES  R. Wilkinson, J. Geist, S. Janet, P. Grother, C. Burges, R. Creecy, B. Hammond, J. Hull, N. Larsen, T. Vogl, C. Wilson, The first census optical character recognition systems conf. #NISTIR 4912, The U.S. Bureau of Census and the National Institute of Standards and Technology, Gaithersburg, MD, 1992. 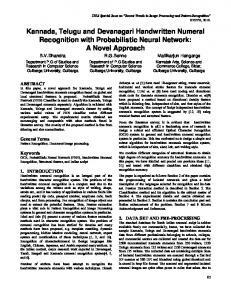 Y. LeCun, L. Bottou, Y. Bengio, P. Haffiner, ”Gradient based learning applied to document recognition”, Proc. 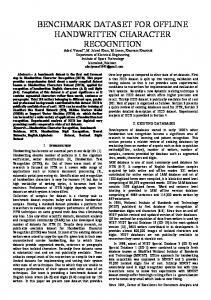 of IEEE, 86(11), 1998, pp. 2278–2324. Report "A Benchmark Kannada Handwritten Document Dataset and Its ... - TC11"